We’re back once again with some new features! You may have noticed a few changes recently on your dashboard, most noticeably the addition of some statistics at the top of the page. 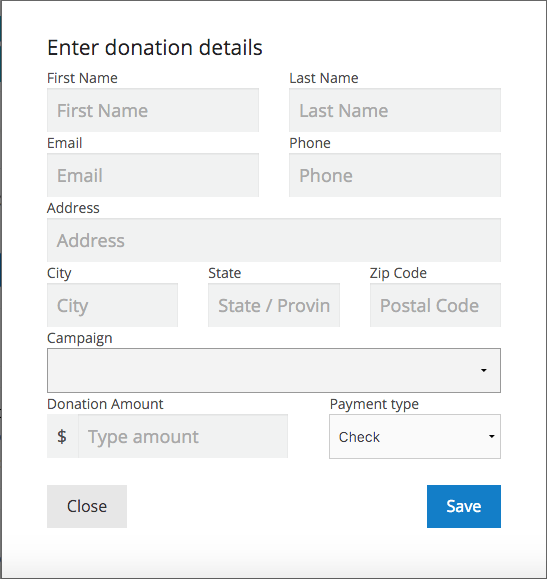 We added these stats – gross donations, average donation, and number of unique donors – to help you keep better track of your donations and the progress of your campaigns. Right below these stats, we have also included an “Add Other Donation” button. This will lead you to a form (see image below) that allows you to add in the information from your offline donations, in order to get a comprehensive look at all the money you’ve raised on our donation platform as well as in person. We have also added a comprehensive list of donations right next to the “Campaigns” tab. Most importantly, you can now filter your donations by date. Once you have set a date range, you can export the corresponding donations in their own CSV file (and the button will let you know just how many donations are included). This is useful if you want to see how many donations you receive in a certain amount of time, be it a year, a month, or a week.